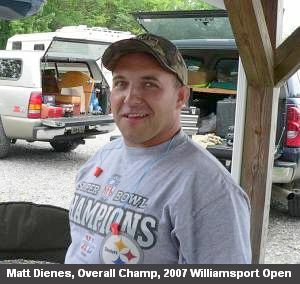 Forum member Matt Dienes triumphed at this weekend’s Williamsport World Open, capturing the Two-Gun Overall Championship (9.215″ Group Agg, 91.250 Score Agg). Congrats to Matt, whose Light Gun and Heavy Gun were both chambered in 300 WSM. Matt’s new HG, smithed by Wes Springman, was just two weeks old. Eric Springman finished second in the Two-Gun, shooting a 30-330 in Light Gun and a 6mm BRXS in Heavy. Finishing Third Overall was William Kilpatrick, running a 6.5-284 in both classes. (Note: this data is from the equipment list; some competitors may have chosen to run their Light Guns in Heavy Class). While many shooters were campaigning 6mms (including Jason), this seemed to be a weekend made for the big 30s. 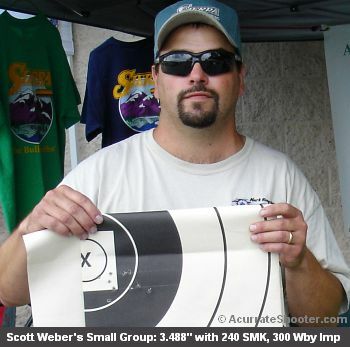 Piloting a 300 Weatherby Improved (with 240 SMKs), Scott Weber won the Heavy Gun Class (5.784″ Group Agg, 96.500 Score Agg) and shot the Heavy Gun Small Group, an impressive 3.488″ ten-shot cluster shown below. This was just one bullet diameter off the Williamsport record. Jennifer Springman finished second in Heavy Gun with her 300 Win Mag, posting a 6.664″ Group Agg plus 92.500 Score Agg. Shannon Lowman won the Light Gun Overall Agg (8.601″ Group Agg, 91.00 Score Agg), shooting a 300 Win Mag. Andy Murtagh finished second in Light Gun (8.995″, 92.00), shooting a 6.5-284 Hoover. Complete match results are found on the Williamsport Website. NOTE: We will update this Bulletin report later with more info and video. Check back tomorrow. Share the post "Matt Dienes Wins World Open — Big 30s Prevail"
If you don’t own a quality digital camera, or need a second camera to keep in your range kit or vehicle, grab this A550 Canon now. It is available from Circuit City for just $128.99. B & H Photo also has the camera for just $134.99 (item CAPSA550). We heartily endorse the Canon point and shoot digital cameras. Many of the photos on this website (and all the images in the current Gun of the Week article) were shot with an inexpensive Canon A60. The A550 is a significant upgrade over the A60. Though inexpensive, the Canon A-Series cameras are capable of pro-quality images. They produce sharp pictures with vivid colors and excellent contrast. The built-in flash is very sophisticated, allowing effortless daylight fill-flash–an important feature we use constantly. Automatic color temp control (so you don’t get greenish skin tones indoors) is best-in-class. The Canons also shoot very decent video in 320 x 240 (QVGA) or 640 x 480 (VGA) format, and the audio quality is suprisingly good. 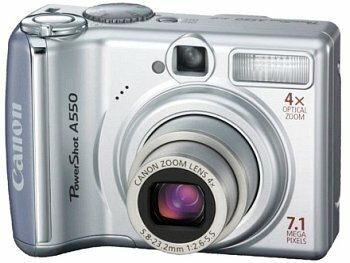 Most of the videos posted on this site were created with Canon A-series point-and-shoot cameras. While the Canon A550 offers an impressive 7.1 megapixel capacity, here’s a tip — if you’re shooting photos for the web, set the resolution at 1600×1200 pixels with the A550. Using that middle resolution will let you store many more images on your memory card. Our only gripe about the Canon A-series cameras is that they can be battery hogs. Always bring spare AAs when photographing an important event. Duracell rechargeable 2650 mAh batteries work great. Share the post "Great Deal on Canon A550–$128.99"